The school year here in Liberia is similar to that of the US, it begins in September and goes through June, closing for July and August. There’s only two seasons in Liberia, rainy season and dry season, so they don’t call it summer break, but that’s what it felt like to me! So I wanted to write an update on what I did this summer…. Shortly after Mom & Kathryn’s visit, we had our semester exams and wrapped up the 2017-2018 school year the first week of July. After grading all of my students’ tests and calculating final grades, I turned in my grade sheets just in time to leave for a visit home! I went home to the US for 3 weeks in July and it was great to be home and see so many friends and family! The big event was Kathryn and Nelson’s wedding in Indianapolis, which was beautiful and I was so thankful to be a part of it. I also spent a weekend in Columbus, celebrating my friend Christine at her bachelorette party. And I spent time at home in Cincinnati, visiting friends, hanging out with my family and eating all the foods that I’ve missed while being in Liberia! 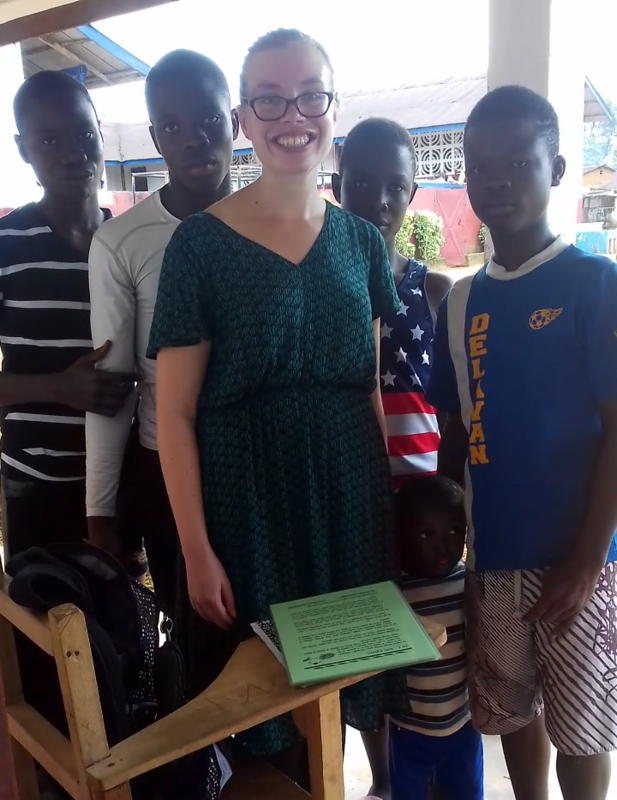 I came back to Liberia at the beginning of August and had a few weeks before school started. After a couple of days of relaxing and settling back into life here, I was ready to find something to do! Though school was closed, the administration and some of the teachers were still at the school working every day, distributing report cards and preparing for the next school year’s registration. Each day there were also several students hanging around the school, so I decided to start a “summer reading” program for those couple of weeks. 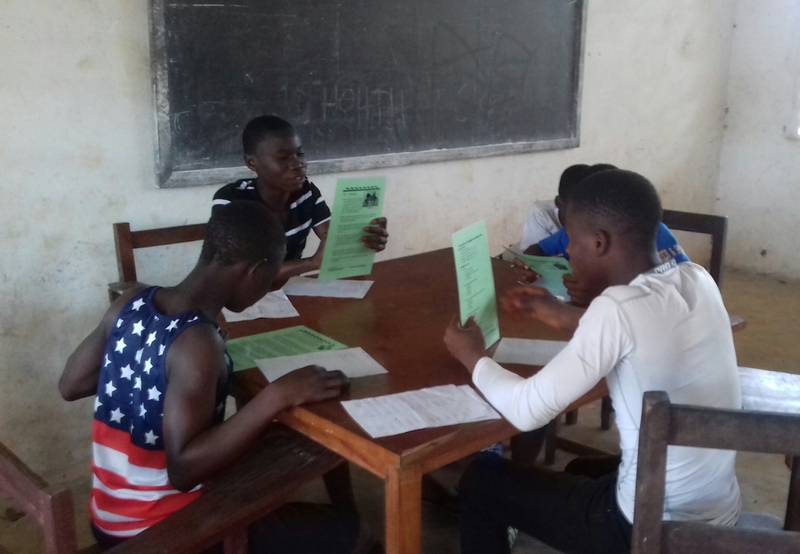 Peace Corps gave each of us volunteers a Liberia Reads to Learn (LRL) kit, a reading program to help students build their vocabulary and comprehension skills and give them an opportunity to practice reading. The program allows students to read at their own ability level and at their own pace, and it gives them a chance to read about many different topics, including science, social studies and literature. The kit includes 6 different reading levels, each with 50 passages about different topics. After students read their own passage, they then answer 10 questions about what they’ve read, around both vocabulary and comprehension. Once they’ve read and passed enough LRLs from one level, they move to the next level, where the passages get more challenging. I began bringing the LRLs to school in the mornings and inviting junior and senior high students to come read. I had done LRLs with my classes several times last year, so I also started telling my students when I saw them around town that they could come to school in the mornings to read. While a few of my previous students came, I was surprised to find that I had more new and younger students coming regularly! There were a couple groups of junior high boys, who would come and spend hours reading LRLs, often disappointed when I told them it was time to wrap up for the day! Overall I had 25 students participate in those two weeks, only 10 of them previous students of mine. Most days I only had about 5 or 6 students, less than I’d hoped for, but I was happy to see the students’ excitement about reading and see several new students progress to the 2nd level and even one to the 3rd in such a short time! After doing LRLs for a couple of weeks, I shifted gears in the last week to start doing WASSCE math classes for the upcoming 12th graders. This coming year, I will be teaching the 12th grade (last year I only taught 10th and 11th) and all 12th graders take the WASSCE exam before graduating. It is a standardized test that is taken in many different countries across West Africa – and from previous versions I’ve seen, the math section looks tough! The list of topics that could come on the WASSCE is extensive and I know that it’ll be impossible to cover everything during class time before the students take the test in April. So I began extra sessions covering topics that I won’t have time for during the school year. Each day was a different topic, where I gave notes and example problems, let them practice and then ended with a real problem from a previous WASSCE from them to try. The students who came were eager to learn and to start preparing for the test, which was good to see and I hope to continue doing extra sessions throughout the school year. Now I’m spending a week at mid-service training (MST) in Kakata, with the rest of LR-7, the cohort of education volunteers that I came with last year. And next week I start my 2nd school year teaching in Liberia! This entry was posted in Africa, Liberia, Peace Corps and tagged Liberia, Liberia Reads to Learn, literacy, Peace Corps, Peace Corps Liberia. Bookmark the permalink.